330 Holy Island species and we’re still counting! (To the left) The front cover showing the island’s most important wintering wildfowl, pale-bellied Brent Geese, caught by Mike Hodgson passing in front of the Castle. The sheer wealth of bird species and much more besides is revealed in a new greatly expanded, updated hardback version of club member Ian Kerr’s The Birds of Holy Island. A total of 330 species of birds are included although with the confirmation of that superb juvenile Pallid Harrier on the island on 15-16 September the island list has risen to 331. The new book also contains anecdotes with a wildlife theme, new and fascinating details about the island’s natural history and the 19th and early 20th century characters who were involved in it. Particularly illuminating are views expressed by some characters about the situation in the post-war period which led to the establishment of the Lindisfarne National Nature Reserve. The book has more than 50 colour pictures, both birds and landscapes, by club members Andy Mould, Mike Hodgson, Tim Dean and Richard Dunn, the author and publishers. There are also newly commissioned maps which include recent developments such as the Window on Wild Lindisfarne at the Rocket Field, the Heugh watchtower and the new hide at the Lough. 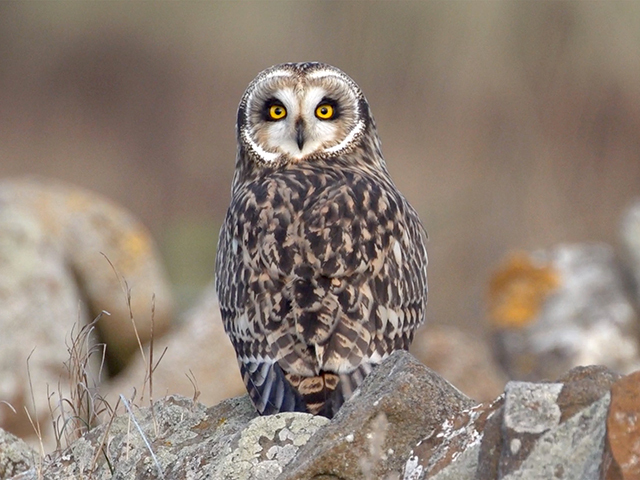 (To the right) A wintering Short-eared Owl helpfully poses on an island wall for Max Whitby (NatureGuides). 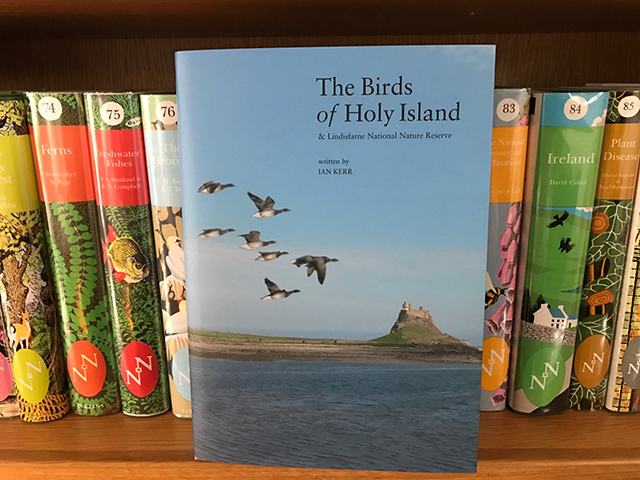 The Birds of Holy Island has been produced by NatureGuides, a natural history publishing company based in London and set up by Max Whitby, probably better known to club members and birders in general as one of the founders of BirdGuides. The new company specialises in creating high quality print and digital field guides for the international market. Among its products is the digital version of the Collins Bird Guide as well as apps covering butterflies, moths, bumblebees and dragonflies. The new publication is a successor to Ian’s very much more modest 2007 soft-back book, now out of print. Ian says that, surprisingly, a lot of previously unpublished historical information about the island’s wildlife has come to light after lying forgotten in various regional archives. It has now been incorporated in the new publication. New species are being added to the island list virtually annually while others not seen there for many years have also been found. These included the spectacular White-tailed Eagle which caused panic among thousands of geese, duck and waders as it soared over the flats in autumn 2014, the first local sighting for over 130 years. 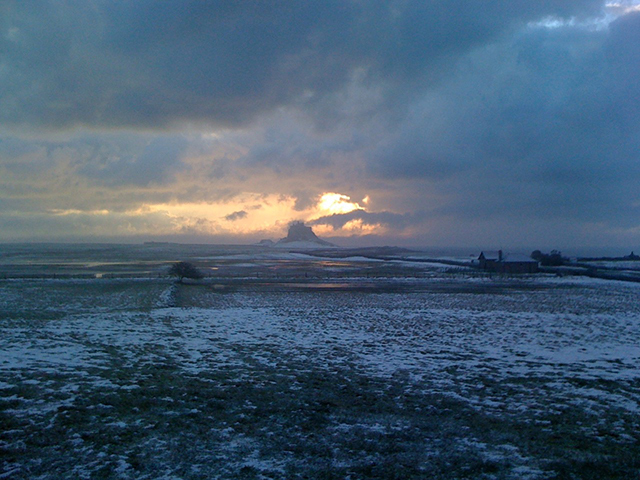 (To the left) This stunning dark wintery morning scene of frozen island fields and the Castle was caught by Fiona Barclay (NatureGuides). Max said that the book was aimed at those with a real love of Holy Island and its wildlife.